What is Grandparent’s Day? Why do we Celebrate it? The motivation for a National Grandparents Day originated with Marian McQuade, a housewife in Fayette County, West Virginia. Her primary motivation was to champion the cause of lonely elderly in nursing homes. She also hoped to persuade grandchildren to tap the wisdom and heritage their grandparents could provide. President Jimmy Carter, in 1978, proclaimed that National Grandparents Day would be celebrated every year on the first Sunday after Labor Day. Grandparents are our heritage and are essential members of our families and communities. Alto Bonito Elementary celebrated this special day on September 10, 2010. It has become an event that Grandparent’s look forward to every year. You are never too young to appreciate and love your Grandparents. Alto Bonito’s 5th grade Science Teacher Jennifer Pena is pictured above with her Grandparents whose unexpected visit was a pleasant surprise. Alto Bonito Elementary students and their grandparents spent time creating projects together and simply enjoying each other’s company. The Grandparent day festivity was a huge success. La Union Elementary students and staff honor grandparents in a grand celebration on Friday, September 10, 2010. 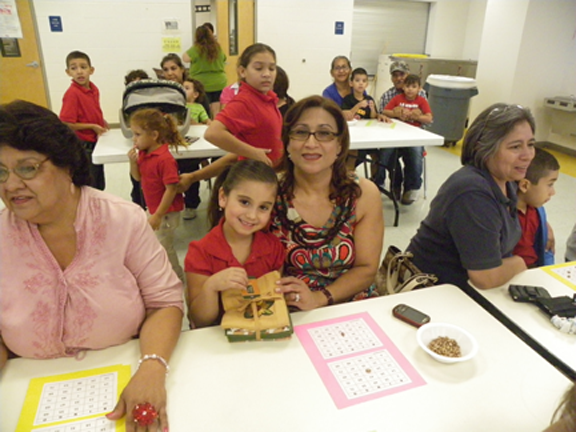 The Grandparents Day festivities were held at the school cafeteria. The school's staff organized a great game of Bingo where grandparents had the great opportunity to spend time with their grandchildren. They also enjoyed a snack of sweet bread and punch. Pictured grandparents with their grandchildren enjoying a game of bingo. (RGCCISD). General Ricardo Sanchez Elementary Library held a reading celebration to pay tribute to the grandparents and foster relationships between them and their grandchildren. Students and grandparents got to bond by playing games, listening to stories read by grandparents or simply just enjoyed sharing a good book.